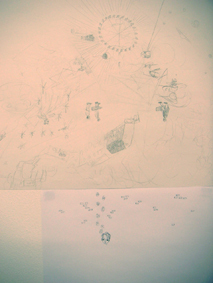 A fresh pot of coffee was brewed. 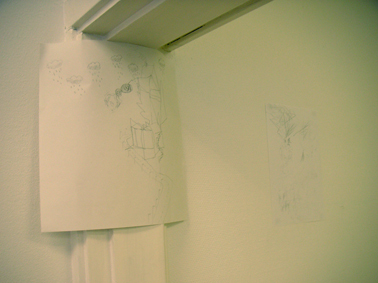 A drawing, which previously had laid on the floor next to the leopardskin blanket, was fastened to the doorpost between the two gallery spaces. 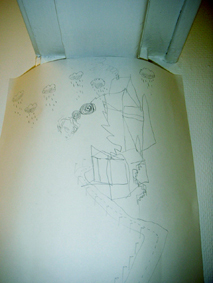 The drawing which was created on the opening night was hung on the wall above the drawing with the bricks and anarchy symbols. 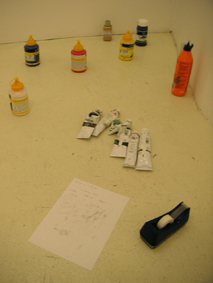 The two drawings created on the previous day were taken into the inner gallery space; one was taped to the wall, the other was placed on the floor. 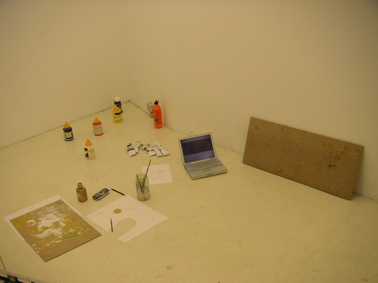 The laptop computer was taken into the inner gallery space and the music recorded on the previous day was heard from it. 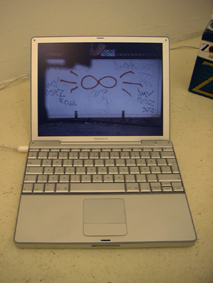 On the computer screen was a photograph of a wall with an infinity sign, a hand showing the middle finger, and some tags graffitied onto it. 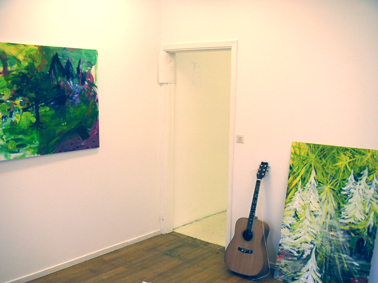 A sheet of wood was taken from the gallery office and taken into the inner gallery space. 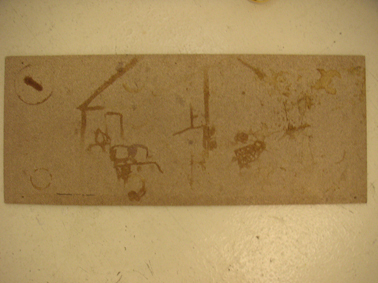 Upon this sheet of wood a drawing of a building with a rehearsal space was made using the coffee. 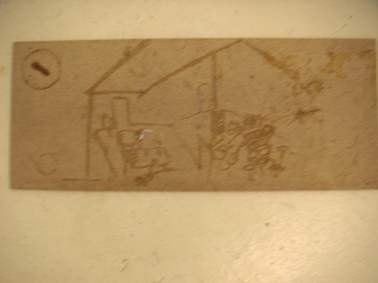 This drawing slowly faded as the coffee was absorbed by the sheet of wood. 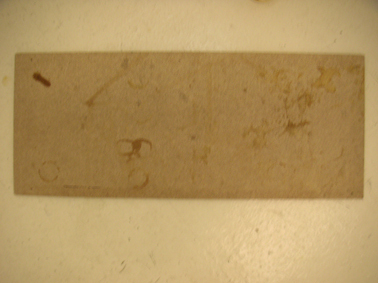 The fading process was documented using a digital camera. 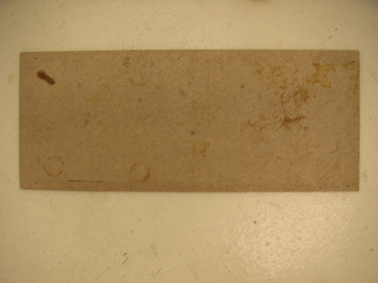 The sheet of wood was placed against the wall. 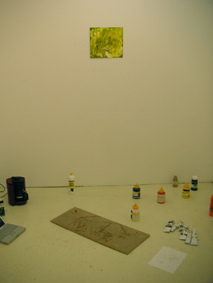 Next to it was the laptop computer; on it's screen the fading process was presented as a series of photographic images. 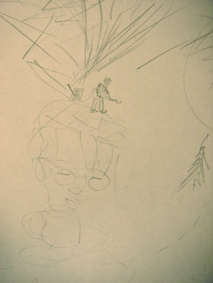 A vocal track was added to the music which had been recorded the previous day. 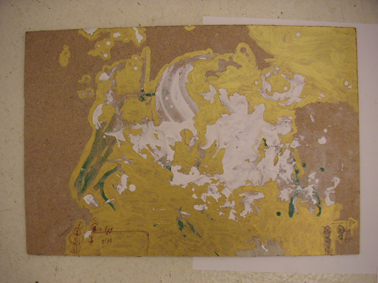 The track was named "Radiating your Memory"
The sheet of plywood that was in the inner gallery space was painted upon using a gold-colored acrylic paint. 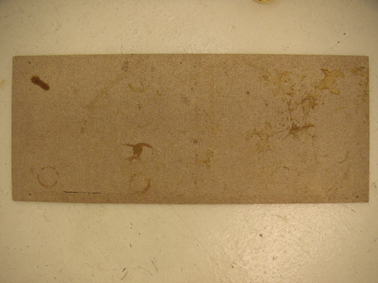 The sheet of plywood already had various marks on it's surface, such as notes written in ink and pencil, some plaster and brush-marks of green acrylic paint. 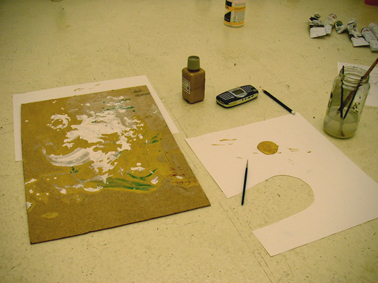 These were carfully painted around using the gold acrylic paint.